You can purchase the Greek for the Rest of Us Laminated Sheet online from ChristianBook.com or from your local bookstore. 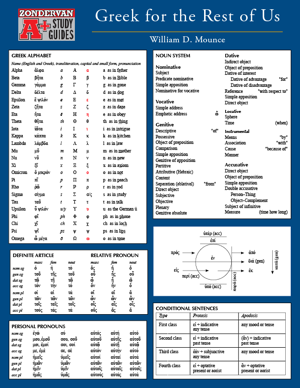 The Get-an-A Laminated sheet for Greek for the Rest of Us by William Mounce is a critical part of acquainting you with the essentials of the language and deepening your understanding of God’s Word. It serves as a handy, at-a-glance study aid, ideal for last minute review, a quick overview of grammar, or as an aid in Bible study.. Many people want to learn Greek in order to better understand the Bible, but very few are able to spend the numerous years required to master Biblical Greek, even those who have a seminary education. The get-an-A laminated sheet for Greek for the Rest of Us by William Mounce is a critical part of acquainting students with the essentials of the language and deepening their understanding of God’s Word. Developed by renowned Greek teacher William Mounce, this Greek for the Rest of Us Laminated Sheet will help students: recite the Greek alphabet; read and pronounce Greek words; learn the Greek noun and verbal system; conduct Greek word studies; decipher why translations are different; see the author’s flow of thought and central message; and read better commentaries.